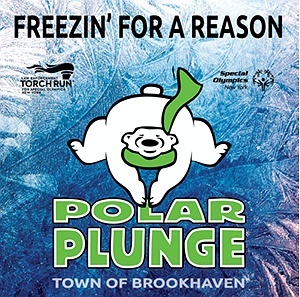 Subject: LongIsland.com - Your Name sent you Event details of "7th Annual Town of Brookhaven Polar Plunge"
Help raise money for the athletes of Special Olympics New York by asking your friends, family, co-workers, etc. to support you in taking the PLUNGE! Then, take a dip or slow crawl into the chilly waters of the Long Island Sound. Special Olympics New York has 67,162 athletes training and competing year-round in 22 Olympics-style sports. Our athletes and their families or caregivers are NEVER CHARGED to participate! It costs $400 to support training and competition for one athlete for one sports season. Set your Plunge goal at $400 and you have sponsored an athlete for an entire season!